"The fun part is how to get there. As you only can view the castle from the river you have two ways to get there. One is driving up there or you can choose the more fun way and park your car at the train station of Anserremme and hike the dirt path along the left bank of the river Lesse. This way you have to walk about 5km along the river through the forest. It is much more fun than driving to the castle. However no matter how you get there to get a good view of the castle you have to cross the river and there is no bridge so you only option is to wade through the river, the river is never really deep." Here is some history of Castle Walzin, most of which is taken from a Google translation of the French-language page on Château de Walzin. 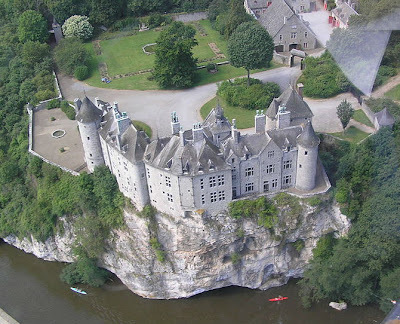 The castle, one of the largest in Belgium, was built in the 11th century to serve as a monitoring station and forward defense for Dinant. The only access to Dinant from the south passed through this location. In 1489, the castle housed William I de La Marck, also known as the Wild Boar of the Ardennes because he was as fierce as his favorite hunting prey. During his time, there was a new wave of sieges and destruction as the castle was caught up in larger continental battles. In 1581, Adrienne de Berlaymont-Brandenburg rebuilt the destroyed parts of the castle and also expanded it. The castle suffered considerable damage in 1793 at the hands of French revolutionary armies, who also destroyed all of its records. Restorations in 1881 by architect Charles-Émile Janlet and from 1930 to 1932 by architect Octave Flanneau created the basic facade that it is known by today. 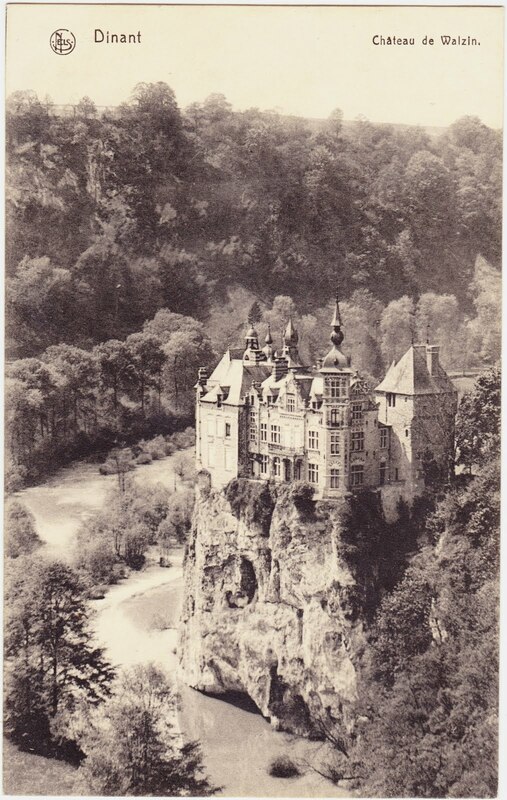 Diomedia hosts another interesting old image of Castle Walzin, a photograph from 1880 that is described as "one of the first halftones." 1. According to the Wikipedia page on the House of Limburg-Stirum, "Count Alexis de Limburg Stirum married in the Castle of Ussé (France), with Countess Béatrix de Blacas d'Aulps, daughter of the 7th Duke and Prince of Blacas d'Aulps." They live in Walzin Castle.